Upon entering the store, it’s impossible to miss the tasteful, and Georgetown-appropriate, mix of wood, metal and brick materials that gives the space a very industrial, yet polished feel. This combination of rough and refined is mirrored in the merchandise selection as it all of it will make you look good while getting your yoga/kick boxing/cross-training/walking/coffee-shopping on. At the front of the store, you’ll also find an indoor bike rack space where shoppers can safely store and lock their bikes. 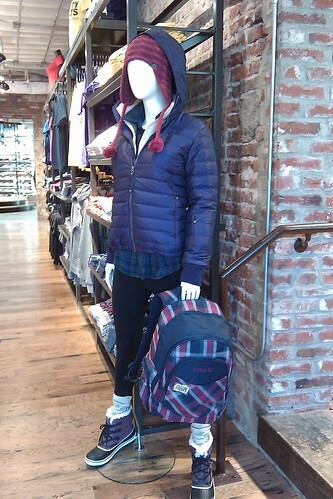 With regards to cycling, the store caters to both the Lance Armstrongs and the messenger bike crowd. Aside from offering the standard Nike, Under Armour, Reebok athletics gear, the store features up and coming brands like Vibram, Avalache, Treetorn, Bogs, etc. that appeal to non-athletes and athletes alike. Should the Georgetown location not have an exact size, they’ve installed iPads that allow shoppers to quickly order and ship what they’re looking for. The iPads also feature local bike and running trail information, product video demos and recommend City Sports tunes. Connecting the first and second floor is a large atrium with large windows and sky lights that make the space feel like a covered outdoor area. As I entered this space, I seriously expected to see a City Sports employee repelling down a rock wall. In this space you’ll also find a semi-circular shoe rack with the women’s selection on one side, men’s on the other. Right next to the shoes is the sunglasses section which features a south facing outdoor patio, so when you’re deciding between what pair on shades to buy you can actually test them outside. How novel! At the top of the industrial staircase to the right is the women’s section which can be transformed into a yoga studio or aerobic class area. Additionally, City Sports has built in lockers for class participants to securely store their bags and personal items. 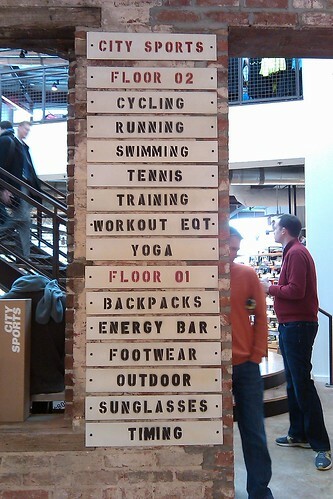 Across the way is the men’s section that focuses heavily on cross-training and compression gear. Again performance and styling go together at City Sports and envisioning this apparel both in and out of the gym isn’t hard. Rounding out the extensive selection, you’ll find all the home gym equipment: kettle balls, free weights, foam rollers, door hanging chin up bars, exercise videos, mats, etc. And, as this is Georgetown, there’s racket sports section featuring tennis racket stringing, and squash and racquetball equipment. 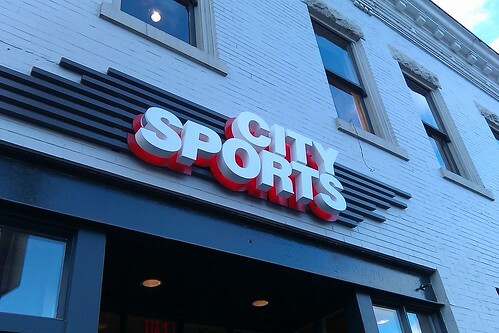 As a former college athlete and general all-around sporty gal, this latest addition to City Sports is a paradise; I seriously wanted to buy everything I saw. 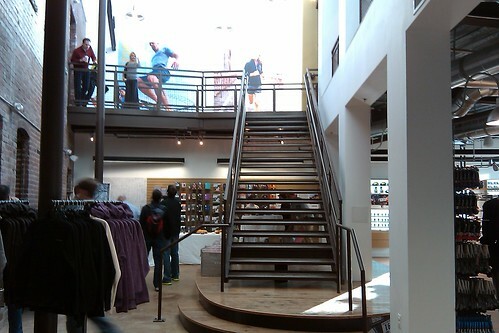 However, I have a feeling that anyone, whether athletic minded or not, will have the same shopping experience as I did. Where the sign says “energy bar” – do they mean they have a single energy bar for sale, or is it a bar where you saddle up and buy energy? @M.V. Jantzen: At the back of the shop they have an energy bar filled with every type of bar, goo, energy jelly beans, drinks, etc. you could ever want. The bar also has its own check out, so you don’t have to wait in the merchandise lines. The times I have been in other City Sports locations, I have found their staff to be friendly and knowledgeable, and a co-worker of mine made the same comment. This is in sharp contrast to, say, a Sports Authority store. Also, City Sports gave me a card good for 10% discounts for being a Y member. If you belong to a health club or gym, ask about it. That said, I never go to Georgetown and will never visit this store. I’ll stick to their other locations.